Queens will head to Ibrox for the 2nd leg of their play-off game against Rangers still very much in contention for a place in Scotland`s top flight despite losing 2-1 to the Glasgow giants in this evenings 1st leg tie at Palmerston. There was virtually nothing between the teams for the opening period of the game, but with half-time fast approaching, Rangers gained the upper- hand after going in front following a delightful free-kick. Queens rallied and drew level midway through the second forty-five, and despite dominating for the large parts of the half, it was the visitors who found the winning goal with just 15 minutes to go to give them a slight advantage ahead of next weekends deciding game. After resting several players for the game at Livingston last time out, Queens named exactly the same starting line-up that brushed aside Rangers on their last visit to Palmerston back in April, as once again the home side settled for a 3-5-2 formation.The hosts made a promising start and inside the opening minutes Danny Carmichael found himself in a good position on the right and his cross into the box was met by the head of Derek Lyle, but `keeper Bell saved comfortably at his near post. Queens were having most of the early possession, although in fairness most of the passing was going backwards, and sideways as they probed for openings in what was clearly a much better organised Rangers defence. 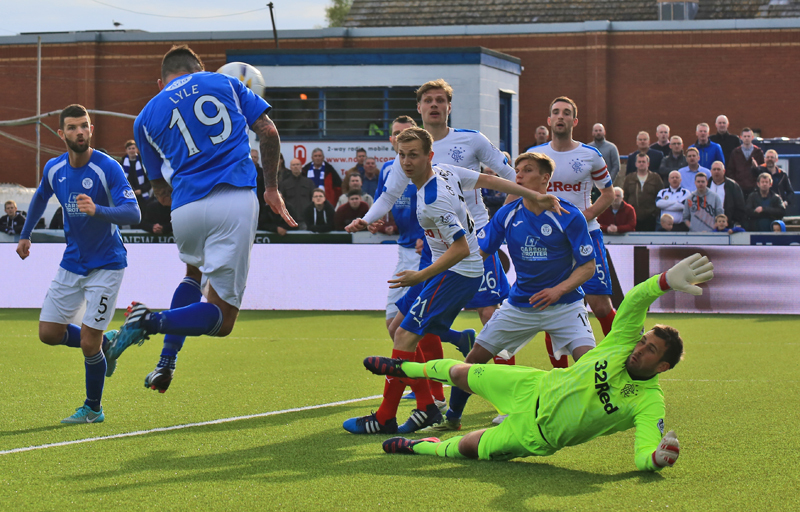 It was very clear from the outset that Rangers had learned from their previous visits to Palmerston as they matched Queens in the same 3-5-2 formation which made it very difficult for the home side to get beyond the Rangers back-line.The visitors first half chance came after 10 minutes when Miller`s ball over the top released Vuckic, but he drove his shot wide of the far upright. Minutes later the same two players were involved in the action, but this time the roles were reversed as Vuckic played in Miller. The Rangers striker, and much of the travelling support thought that he had opened the scoring after he raced through to comfortably beat Zander Clark, but the assistant`s flag had been raised for offside and the goal was ruled out. It was a very close call, and fortunately for Queens, it went in their favour. The first effort on target came from Rangers when Shiels shot straight at Clark after good link up play involving both Shiels and Smith, but it was the home side who really should have made the breakthrough after 20 minutes. After winning their first corner of the game, Ian McShane`s delivery to the near post picked out the run of Mark Durnan, but under no pressure and with a big area to aim for, the big defender was unable to direct a header goalwards as the ball hit his shoulder and flew well wide. Durnan was on the end of another promising move minutes later after Lyle, Carmichael and then Stephen McKenna all combined to create a shooting chance for the defender, but his effort was well wide and landed in the massed ranks of the away support on the Terregles Street terracing. The first of three Queens yellow cards was shown to Stephen McKenna following a challenge on Shiels in midfield just past the half hour mark, however the visitors failed to put Queens under any significant pressure from the resulting set-piece. Lewis Kidd then showed some excellent skill and close control as he led a quick break broke down the right wing, although unfortunately for Queens his initial good work was wasted after his whipped in cross evaded both Lyle, and Carmichael who were both well placed inside the 6-yard box. On 36 minutes Zander Clark made a comfortable save from a long range effort by Murdoch, and as the play switched quickly to the other end, Kidd played a pass inside to Lyle whose drive from just outside the box was easily held by Bell. Both teams were playing some decent possession football, but neither had been able to find the final telling pass that could have unlocked either of the well organised defences.As the game moved towards the interval, each side had the opportunity to take the lead following a set-piece. Firstly it was Queens` chance after Dowie`s long ball had been well collected by Reilly, the striker was flattened from behind by Zaliukus some 20-yards from goal in what was a similar position from which Kevin Holt scored against Rangers from earlier in the season. However, with the home fans in the crowd of 5224 expecting Holt to be involved again, Lewis Kidd stepped forward and drove the ball straight into the Rangers wall - a disappointing end to what was a promising position for Queens. Where Queens fans were disappointed with that outcome, the visiting fans at last found their voices as their team took the lead. As both Dowie, and Vuckic challenged for a loose bouncing ball 30-yards out, referee Muir, judged that Dowie had been guilty of fouling the Newcastle loanee and awarded a free-kick. With both Smith and Vuckic poised over the ball, it was left to Smith to curl in a superb effort that flew in via the underside of the crossbar giving Zander Clark absolutely no chance of keeping it out. There was no arguing with Smith`s finish, but it did appear that the initial foul was on Dowie and the free-kick did seem somewhat harsh on the hosts. There was barely time for the match to re-start, and it was Rangers who left the field with a spring in their step. The visitors were quickly into their stride at the the start of the 2nd half, and Miller found himself clear on the left, and when his curling shot was palmed away by Clark, it fell nicely into the path of scorer Smith whose net bound drive was headed away as Queens came under strong pressure. After that early scare, Queens rallied well and started to control the game. Carmichael`s pace was always a threat, and his run and cross led to Queens winning their first corner of the half. McShane`s delivery was deep to the far post and was met by McKenna but the ball had too much pace on it for him to direct it towards goal. Carmichael was at the heart of most of Queens attacks, and once again he was able to glide past McGregor before delivering a cross that was only just too far ahead of the onrushing Reilly. McShane`s cross to the back post caused problems for the Rangers defence as two players went for the same ball which left the unmarked Derek Lyle to head home from close range. As Queens grew in confidence, the visitors became somewhat rattled, and Kevin Holt almost gave the home side the lead, but his curling shot after a jinking run drew a fine save from Cammy Bell, and from the resulting corner, Lyle headed not too far wide as Queens continued to press forward. Defender Zaliukus was booked for a foul on Reilly, and as tempers began to flare, Carmichael was sent crashing to the ground by a late challenge from Foster, that on another day, could have been a red, rather than a yellow card for the Rangers defender. However, minutes later, Foster was heavily involved in the move that led to Rangers going ahead for the second time in the game. Vuckic held the ball up well on the right and with Foster in support, the two combined to allow Foster to skip beyond the challenge of Holt and pick out Shiels who glanced a header beyond Clark in front of the joyous Rangers support. It was a sickening blow for Queens who introduced both Michael Paton, and Iain Russell in the later stages, but with Rangers having something to protect, it was hard for Queens to get beyond the Rangers defence. They did have a couple of half chances late on, a header from Holt did not have the power to test Bell from Paton`s cross, and Reilly`s run and cross almost picked out Paton at the near post, but for Queens on the night, it just was not to be. To add to the frustration, both Millar, and Russell made it into referee Muir`s notebook, with both players being guilty of late challenges. Danny Carmichael won the sponsors award for man-of-the-match, and although Queens are still very much in the tie, it will be the visitors who will be the favourites to make it through to the next stage, although with this Queens team, you just never know what might happen next!!! 17:02 Today`s Referee is Alan Muir, who is assisted by Alan Mulvanney and Stephen Mitchell. 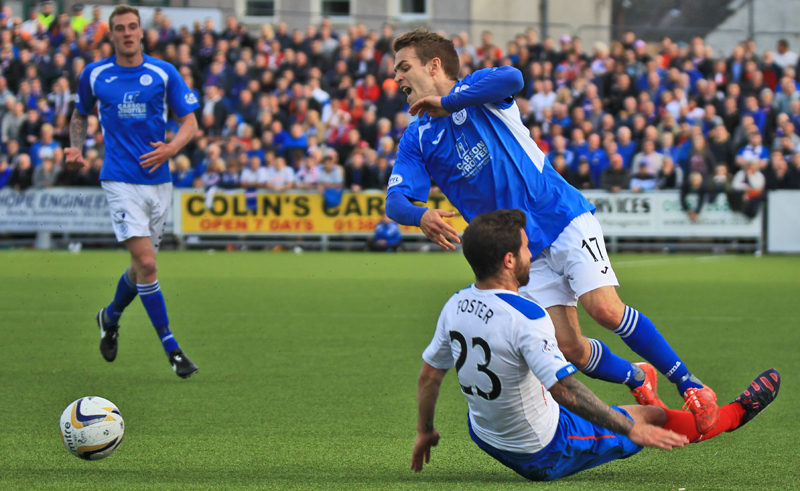 17:26 Five minutes to go here at Palmerston. I f you couldn`t make the game remember we are live on BT Sport. 9 min Vuckic races through on goal but drags his shot wide. 15 min Shiels drills his shot right at Clark, Rangers looking more dangerous in the opening 15 minutes. 25 min Durnan blasts well over from 30 yards out. 40 min Free kick in a promising position for Queens as Gavin Reilly is wiped out. 45 min Stevie Smith hits an unstoppable free kick from 25 yards out. Queens players and fans not happy with the free kick however. Half Time both teams are back out on the park and we`re almost ready to go, come on Queens! 68 min Kevin Holt almost puts Queens in the lead with a fantastic effort from the edge of the box. 75 min Dean Shiels heads home from five yards out to put Rangers in front. 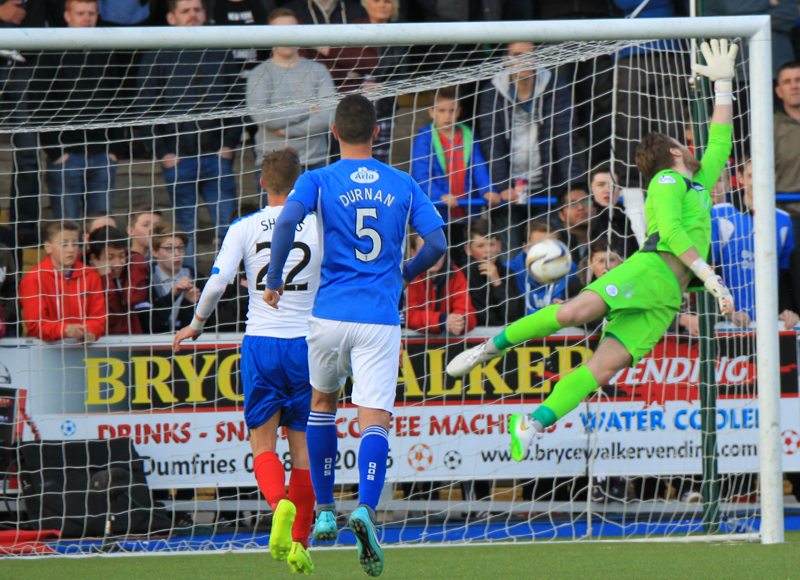 89 min Not long left at Palmerston, Queens are searching for an equaliser. 19:26 Queens travel to Ibrox next Sunday 2-1 down. Match report and reaction to follow.